Xbox Music to offer streaming, downloads and cloud storage? Xbox Music - will the pupil become the master? Rumours are afoot that Microsoft's recently announced Xbox Music service hopes to take on iTunes, Spotify and iCloud and loads of other stuff all in one go. Those 'with knowledge of the situation' told Bloomberg that the public-yet-still-quite-secret service will offer streaming, music downloads and cloud storage in one Xbox-centric package. It seems that Ballmer and co have been letting other companies make all the mistakes before swooping in with a Frankenstein's-musical-monster service incorporating the best features of each. That's not to say it hasn't made a few mistakes of its own, what with the Zune downloads store not exactly managing to beat iTunes at its own game and Zune hardware quickly fizzling out. The sources say that Microsoft is currently in talks with the major record labels (Universal, Warner, Sony and EMI) which it will need to get on board before it can properly launch a music service, lest it mess it all up like Google Music which launched sans rights and didn't exactly flourish because of it. 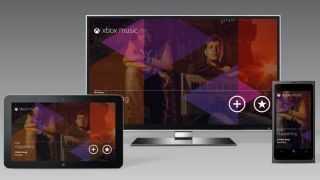 Although Xbox Music was announced at E3 2012, details on what it will actually entail have been scarce, other than the fact that it will tie in to Windows 8 and Windows Phone 8. Microsoft isn't letting anything more slip, simply stating that "Xbox Music will bring you a world class music library and great new ways to enjoy, share and discover new music on the Xbox console, Windows Phones and Windows 8 PCs and tablets. We will have more to tell you soon about our specific plans."